It has been suggested  that the resolution of the information paradox for evaporating black holes is that the holes are surrounded by firewalls, bolts of outgoing radiation that would destroy any infalling observer. Such firewalls would break the CPT invariance of quantum gravity and seem to be ruled out on other grounds. A different resolution of the paradox is proposed, namely that gravitational collapse produces apparent horizons but no event horizons behind which information is lost. This proposal is supported by ADS-CFT and is the only resolution of the paradox compatible with CPT. The collapse to form a black hole will in general be chaotic and the dual CFT on the boundary of ADS will be turbulent. Thus, like weather forecasting on Earth, information will effectively be lost, although there would be no loss of unitarity. Some time ago  I wrote a paper that started a controversy that has lasted until the present day. In the paper I pointed out that if there were an event horizon, the outgoing state would be mixed. If the black hole evaporated completely without leaving a remnant, as most people believe and would be required by CPT, one would have a transition from an initial pure state to a mixed final state and a loss of unitarity. On the other hand, the ADS-CFT correspondence indicates that the evaporating black hole is dual to a unitary conformal field theory on the boundary of ADS. This is the information paradox. Recently there has been renewed interest in the information paradox . The authors of  suggested that the most conservative resolution of the information paradox would be that an infalling observer would encounter a firewall of outgoing radiation at the horizon. There are several objections to the firewall proposal. First, if the firewall were located at the event horizon, the position of the event horizon is not locally determined but is a function of the future of the spacetime. Another objection is that calculations of the regularized energy momentum tensor of matter fields are regular on the extended Schwarzschild background in the Hartle-Hawking state [3, 4]. The outgoing radiating Unruh state differs from the Hartle-Hawking state in that it has no incoming radiation at infinity. To get the energy momentum tensor in the Unruh state one therefore has to subtract the energy momentum tensor of the ingoing radiation from the energy momentum in the Hartle-Hawking state. The energy momentum tensor of the ingoing radiation is singular on the past horizon but is regular on the future horizon. Thus the energy momentum tensor is regular on the horizon in the Unruh state. For a third objection to firewalls I shall assume that if firewalls form around black holes in asymptotically flat space, then they should also form around black holes in asymptotically anti deSitter space for very small lambda. One would expect that quantum gravity should be CPT invariant. Consider a gedanken experiment in which Lorentzian asymptotically anti deSitter space has matter fields excited in certain modes. This is like the old discussions of a black hole in a box . Non-linearities in the coupled matter and gravitational field equations will lead to the formation of a black hole . If the mass of the asymptotically anti deSitter space is above the Hawking-Page mass , a black hole with radiation will be the most common configuration. If the space is below that mass the most likely configuration is pure radiation. Whether or not the mass of the anti deSitter space is above the Hawking-Page mass the space will occasionally change to the other configuration, that is the black hole above the Hawking-Page mass will occasionally evaporate to pure radiation, or pure radiation will condense into a black hole. By CPT the time reverse will be the CP conjugate. This shows that, in this situation, the evaporation of a black hole is the time reverse of its formation (modulo CP), though the conventional descriptions are very different. Thus if one assume quantum gravity is CPT invariant, one rules out remnants, event horizons, and firewalls. Further evidence against firewalls comes from considering asymptotically anti deSitter to the metrics that fit in an S1 cross S2 boundary at infinity. There are two such metrics: pe- riodically identified anti deSitter space, and Schwarzschild anti deSitter. Only periodically identified anti deSitter space contributes to the boundary to boundary correlation func- tions because the correlation functions from the Schwarzschild anti deSitter metric decay exponentially with real time [8, 9]. I take this as indicating that the topologically trivial periodically identified anti deSitter metric is the metric that interpolates between collapse to a black hole and evaporation. There would be no event horizons and no firewalls. The absence of event horizons mean that there are no black holes – in the sense of regimes from which light can’t escape to infinity. There are however apparent horizons which persist for a period of time. This suggests that black holes should be redefined as metastable bound states of the gravitational field. It will also mean that the CFT on the boundary of anti deSitter space will be dual to the whole anti deSitter space, and not merely the region outside the horizon. The no hair theorems imply that in a gravitational collapse the space outside the event horizon will approach the metric of a Kerr solution. However inside the event horizon, the metric and matter fields will be classically chaotic. It is the approximation of this chaotic metric by a smooth Kerr metric that is responsible for the information loss in gravitational collapse. The chaotic collapsed object will radiate deterministically but chaotically. It will be like weather forecasting on Earth. That is unitary, but chaotic, so there is effective information loss. One can’t predict the weather more than a few days in advance. Physics would have been “far more interesting” if scientists had been unable to find the Higgs boson at the Large Hadron Collider (LHC) in Cern, according to Stephen Hawking, who has admitted to losing a bet as a result of the discovery in July last year. The world-famous cosmologist was speaking at an event to mark the launch of a new exhibit on the LHC at London’s Science Museum and, in a speech, discussing the unanswered questions at the edges of modern physics as part of a history of his own work in the field. Though the Higgs boson was predicted by theory in the early 1960s, not everyone believed it would be found. If it had not been found, physicists would have had to go back to the drawing board and rethink many of their fundamental ideas about the nature of particles and forces – an exciting prospect for some scientists. 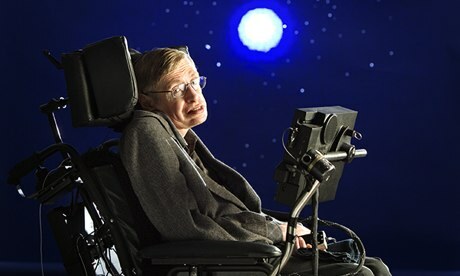 Hawking hoped the LHC would now move on from the Higgs boson to looking for evidence of more fundamental theories that explain the nature universe and, in particular, he hoped it would find the first evidence for the M theory, which is the best candidate that physicists have to unify all the four fundamental forces of nature. It unites gravity (which rules at the largest scales of the universe) with quantum mechanics (which controls the behaviour atoms and below). As yet there has been no incontrovertible experimental evidence to show that M theory is correct. Supersymmetry is the concept that each known particle – such as electrons, quarks and photons – has a heavier and as-yet-undetected “superpartner”. The superpartners of quarks and electrons, for example, are called squarks and selectrons; the superpartners of the Higgs, and of force carriers such as the photon, are the higgsino and photino. Experimental evidence for the idea has, however, been elusive. Hawking is no stranger to losing bets about the nature of cosmos. Along with Kip Thorne, he bet John Preskill that information should be destroyed when something fell into a black hole. The so-called “information paradox” was troubling because Hawking’s calculations suggested that anything that fell into a black hole would be obliterated, including the information about what that stuff was. But destroying information is not allowed under the rules of quantum mechanics. Many of Hawking’s insights have come from studying the cosmos, and the scientist said people needed to get more interested in the space around us for more prosaic reasons. “We must also continue to go into space for the future of humanity. I don’t think we will survive another thousand years without escaping beyond our fragile planet. I therefore want to encourage public interest in space, and I’ve been getting my training in early,” he said. Hawking recently took part in a zero-gravity flight, which is part of the training for astronauts to experience the weightlessness of space. Stephen Hawking is known for his research into relativity, black holes, and quantum mechanics, as well as for the disease that has left him almost entirely paralyzed. But the theoretical cosmologist says that, were he to start from scratch, he wouldn’t focus on physics. What would Stephen Hawking do with his life if he had to do it all over again? Hawking, as you know, was one of the world’s most illustrious physicists and science author. And now he’s out with a new book, a personal memoir entitled “My Brief History,” out this week from Bantam. He doesn’t give many interviews as his illness does not allow him to converse in real time, but he did agree to answer a few questions we put to him. And I think some of his responses may surprise you. Let me give you those right now. First, we asked him, are there any mysteries about the universe you think we may never be able to answer, questions beyond the reach of science? STEPHEN HAWKING: I believe there are no questions that science can’t answer about a physical universe. Although we don’t yet have the full understanding of the laws of nature, I think we will eventually find a complete unified theory. Some people would claim that things like love, joy and beauty belong to a different category from science and can’t be described in scientific terms, but I think they can now be explained by the theory of evolution. FLATOW: We asked him another question – and I think this gave us a really interesting answer. We asked him if you were to start your career over again now, starting now, what would you study and why? HAWKING: If I were starting research now, I might study molecular biology, the science of life. Crick and Watson discovered the double helix structure of DNA and the genetic code in 1953. I did not realize its significance in 1957 when I had to choose a science to specialize in. In my school, the brightest boys did math and physics, the less bright did physics and chemistry and the least bright did biology. I wanted to do math and physics but my father made me do chemistry because he thought there would be no jobs for mathematicians. FLATOW: And finally we asked him what scientific question outside of physics most intrigues you? HAWKING: The biggest unsolved problem in science, outside physics, is the origin of life. Did it arrive spontaneously on Earth, and if so how, or did it come from another planet on a meteorite? He’s the one man on the planet who science geek Sheldon Cooper is really impressed by. Renowned theoretical physicist Stephen Hawking made a surprise appearance at Friday’s Big Bang Theory panel at Comic-Con in San Diego, California. And the 71-year-old genius – who is idolized by Jim Parson’s character on the hit show – even apologized to the gob-smacked audience that he could not be there in person during his pre-recorded video segment. 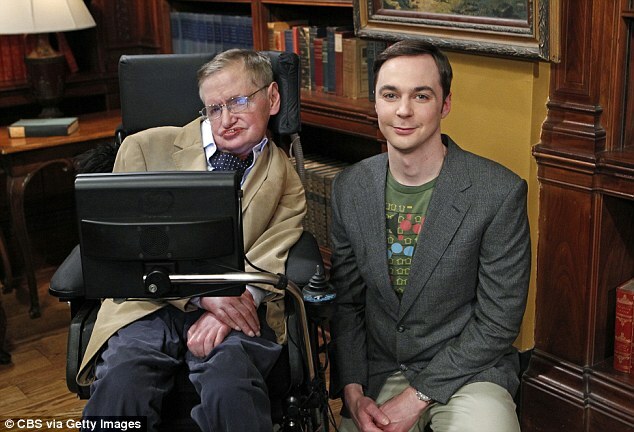 And the amazing Oxford born physicist and cosmologist joked that he enjoyed playing games with Sheldon. ‘When I’m not playing Words With Friends with Sheldon, I like to think about the universe,’ he revealed. Then, much to the delight of the assembled fans, Hawking decided to explain the Big Bang theory in 17 words by singing the show’s theme song.